About half of the US States the same basic flag: plain designs that feature a seal or coat of arms on an otherwise plain blue banner. This makes it hard to tell apart the flags of states like Michigan, Vermont and Nebraska. In Canada, however, there are more unique designs. First, there is the Quebecois flag, the Fleurdelisé, an ancient design featuring four fleur-de-lis around a simple white cross. Then there’s the flag of Nova Scotia, which takes its cues directly from the Scottish flag, reversing the colors and adding the Scottish coat of arms. But not all the Canadian flags are as well-designed. The flag of Alberta consists of a simple shield on a blue background, just like its American neighbors, and the flags of Manitoba and Ontario are simple variations on the British Red Ensign. Today we’re going to take a look at the flag of Ontario. The British Empire used a complex series of flags to represent its colonies. These flags, known as ensigns, came primarily in red white and blue. As the empire grew, individual colonies started to “deface” their flags with a seal or coat of arms. Today there are still scores of flags based on this template. Australia and New Zealand both use a defaced Blue Ensign, while Fiji and the Royal Air Force use sky blue British Ensigns. For much of its history, Canada used a defaced Red Ensign. That all changed in the early 1960s. In 1963, the Canadian Prime Minister called for the country to have its own unique flag. Thus began a great debate across the Dominion. After several good designs and many, many bad ones, parliament narrowly approved the Maple Leaf Flag that we know today. The Maple Leaf flag was popular, but many Canadians still preferred the old Red Ensign. Soon the central provinces of Ontario and Manitoba created their own provincial flags, based strongly on the old design. Today the flags of these neighboring provinces are almost identical. Both are Red Ensigns with a simple shield, and both shields have a red and white Cross of St. George in the upper third of the field. The flag of Ontario has three maple leaves on the lower part of the shield, while Manitoba has a bison on the the range. That’s it. Just a few square inches (or since we’re talking about Canada, square centimeters) differentiate these two flags. Let’s look at how we can remedy this. Ontario’s official provincial flower, the trillium, has been used for years as a symbol of the Ontario government. It’s also been used on the Franco-Ontarian flag, a green and white banner that represents the French speakers in the province. 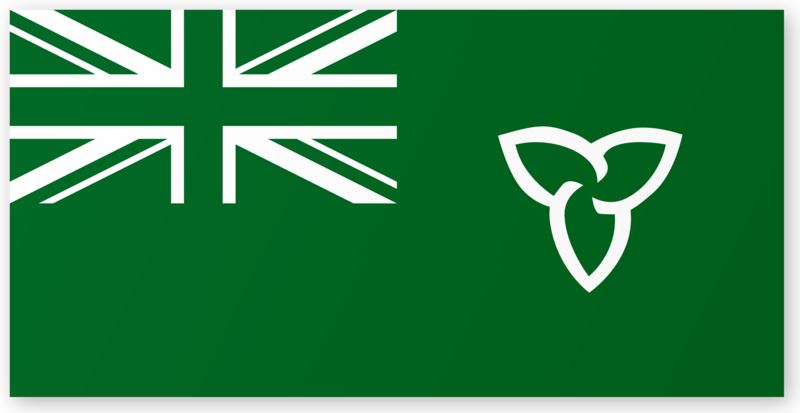 With a stylized trillium and a simple summer=green / winter=white symbolism, this flag is the perfect inspiration for a new flag of Ontario. But I didn’t want to throw out the old flag entirely. There are still a lot of Ontarians who are loyal to the British Empire, so I decided to keep the Union Jack. Thus I started with a trillium-defaced Green Ensign. I liked the basic design, but the blue and red on the canton clashed with the green field of the flag. Remembering that the best designs are monochromatic, I simplified the Union Jack to a simple white design. The result is the flag featured at the top of the page. It is a distinctive design that still pays homage to the Empire. I think it would be an excellent new symbol for Ontario. What do you think? No, it looks silly. 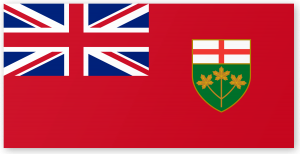 Keep the Ontario Red Ensign as it is. There is never any discussion of Quebec ever changing their flag to appease minorities, so neither should any other province do the same, period. 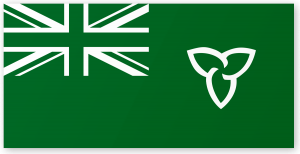 I support changing the Ontario flag, but making the Union Jack green is just silly. Ontario’s colours are red and black, so any new flag should incorporate at least one of those colours. Replace the green Union Jack with the red-and-white Canadian flag and you’ve got a winner!
. and lighten the green a bit. That’s not a bad idea. Thanks for your input! Very bad idea. The suggestion to change our flags is a sign of an immature society insecure in its identity. The Union Jack doesn’t signify loyal to any empire but it could easily be argued that it is a sign of our success. All Ontarians, regardless of ethnicity or background, benefit from the positive legacy the British bequeathed us: political stability and economic progress are key British institutions. Why aren’t we like Venezuela? Because the Brits got here first? One of the hardest things to do today is constructively engage with our history. So much negatively and ignorance, distortion due to political activism. Let’s just leave our flags, symbols and emblems alone. Keep the original colors on the Union Jack or remove it completly, The problem with the current flag based upon the Red Ensign is the link with U.K. Is predominant but the link with Canada is a little bit week and their no “Ontarian” sign in the flag. And i found the english flag (red cross on white ) a little bit redondant with the union jack also on the flag. Also i found the trillium made with 3 maple leaf as the most smart and beautiful. You got all a flag with says Ontario (Trillium) in the middle of Canada. Which is perfect!